A heartwarming and enlightening collection of advice, wisdom, and practical skills featuring an all-star cast of fathers from the popular online community Life of Dad. Becoming a dad gives men a VIP pass into the greatest club on earth: fatherhood. Its rewards are unmatched, its challenges, uncharted. The experience can reach euphoric highs and gut-punching lows. For those moments (and everything in between), The Life of Dad has your back. 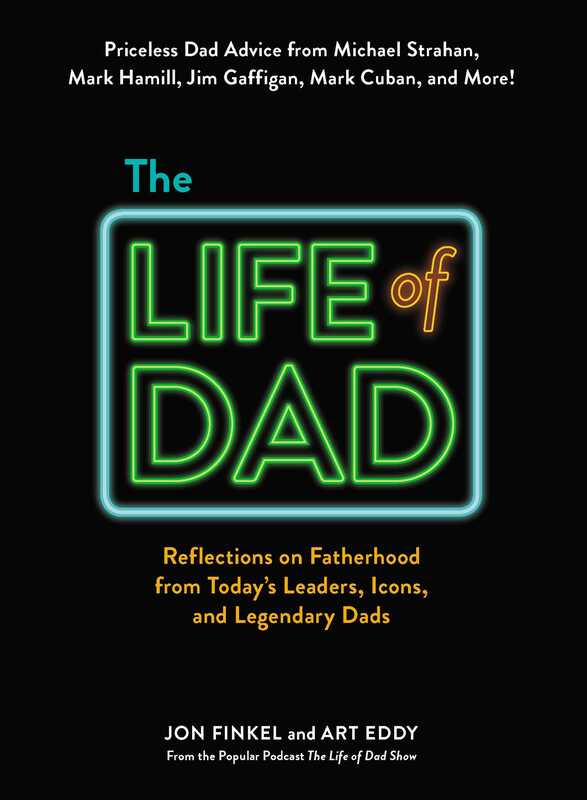 The Life of Dad is an all-encompassing, entertaining distillation of the full dad experience, through a collection of interviews, podcasts, online chats, Facebook Lives, and more, dispensing collective wisdom from dads who have been in the trenches. From Shaquille O’Neal explaining how he’s taught his kids to be grateful, or Michael Strahan highlighting the importance of accountability, or Jim Gaffigan discussing the challenges of having a house full of kids, The Life of Dad has it all. Including thoughts from Ice Cube, Henry Winkler, Chris Jericho, Denis Leary, Freddie Prinze Jr, Charles Tillman, Mark Feuerstein, and many, many more, you’ll find plenty of camaraderie in the hardest—but most rewarding—job of your life! Jon Finkel is the author of The Athlete: Greatness, Grace and the Unprecedented Life of Charlie Ward, “Mean” Joe Greene: Built By Football with 4x Super Bowl Champion Joe Greene, Heart Over Height, The Dadvantage, and Jocks-in-Chief. He has written for Men’s Health, Men’s Fitness, The New York Times, GQ, Details, Yahoo! Sports, and many more. His NBA book series, Greatest Stars of the NBA won several American Library Association awards and the twelve books were a part of their famous Read to Achieve program. He is the cohost of the weekly Life of Dad Sports Show with Art Eddy, blogs for Life of Dad, and is the publisher of Beckett Media. Art Eddy is one of the cofounders of Life of Dad. He hosts and produces all of the Life of Dad podcasts as well as several Facebook Live shows. He is also an editor and featured blogger on Life of Dad and has grown with the brand since its inception. Art has worked in radio in New York City, New Jersey, and New Hampshire. "The first benefit of this book was to get me out of my own head and into the minds of other dads, and that has been tremendously helpful! I worry all day long! I need to get out of the negative head space, and into an arena where I can hear solutions, suggestions, and funny stories so that I do not get caught up in the personal day to day struggles without realizing that the light at the end of the tunnel is not an on-coming train!"